To Make Ahead: Prepare salad dressing up to 3 days in advance; mix well before serving. 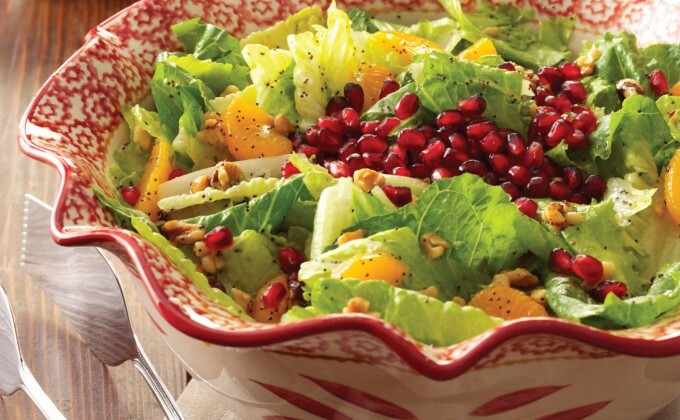 In a temp-tations® 3.5 quart serving bowl, combine romaine, oranges, and walnuts. Place oil, sugar, vinegar, poppy seeds, salt and mustard in a jar with a tight-fitting lid; shake well. Pour desired amount over romaine mixture; toss to coat. Sprinkle with pomegranate seeds. Refrigerate remaining dressing.